- Great Story. Nicely written script. - Editing and pacing was good. - Cinematography wasn't that bad. - Acting was excellent; especially Robert De Niro and Anne Hathaway, who both shared a strong chemistry together. - Robert's character was a bit of a "Gary Stu" type of character, where he was basically too perfect. - Romance involving De Niro's character felt unnecessary, and it really didn't add anything to the overall story itself. 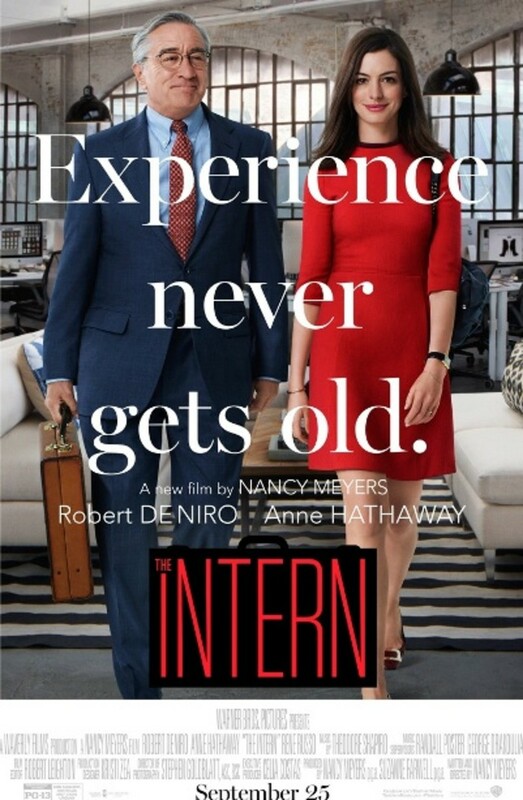 Although "The Intern" may not be getting the box office love it richly deserves, you can't deny how incredibly potent it speaks to today's generation, and how it shows that sometimes even within the modern digital era that we live in now that even old people can offer something to contribute. In this latest comedic drama, Robert De Niro plays an old retired phone book company executive named Ben. Sure, he admits to loving retirement at first, but he can't help but feel there's a void in his life. Not to mention the fact that his wife being dead for several years doesn't help. However, things change one day when he comes across a local flyer asking for senior interns for an online clothing company. All Ben has to do is upload his cover letter on youtube, so they can review his application. Needless to say, he does, and he inevitably gets the job. In fact, he's immediately placed with the companies' founder, Jules (Anne Hathaway), who's against the idea entirely, but she inevitably gets coerced to go along with it. Like most movies, she inevitably forms of a bond with Ben, where he becomes something like a father figure to her. Not to mention the entire company as well. Throughout the movie, Ben is often seen giving advice to many of his younger colleagues; ranging from various dating issues to life in general. He even points out, to a young man, how impersonal sending an apology email to his girlfriend is versus just talking to them directly about it. Heck, he even offers one of his other young coworkers a place to stay, after his parents threw him out. Indeed, you could say that Ben becomes everyone's new "daddy" at this new job. In anything, you could argue that this might be the only real issue with the movie itself. The simple fact is that Ben is sort of a "Gary Stu" type of character, who really doesn't seem to possess any real flaws about him. Sure, he's shown getting emotional during a few scenes, but most of the time he seems like an all around perfect guy that you would want to have around. However, it's forgivable for the most part considering how well everything else was set up. Another minor nitpick that I have is the romance involving Robert's character does seem a bit out of place considering it doesn't fit in with the rest of the story. Granted, it's rarely ever touched upon throughout most of the film, but it just feels a bit out of place. As for the acting, I thought everyone played their parts rather well. In fact, this was arguably Robert De Niro's best comedic performance since "Meet the Parents", as his dry charming wit certainly shines through in this film. 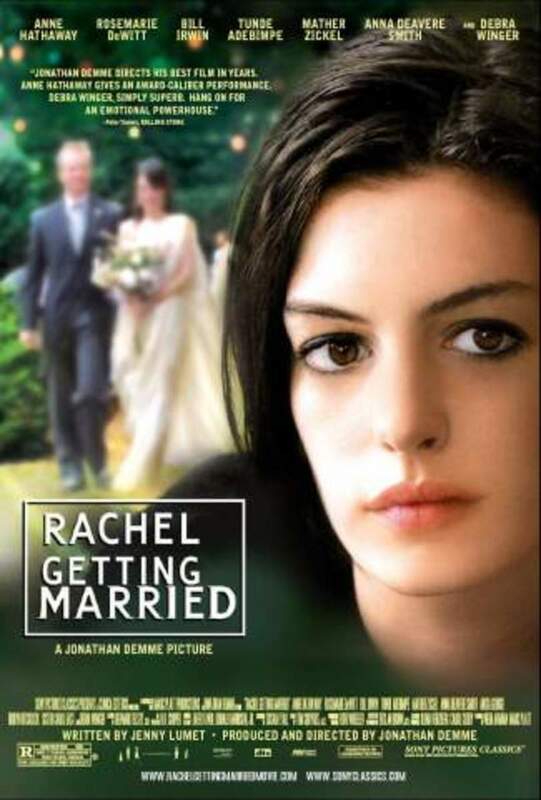 Plus, Anne Hathaway kills it as the young executive striving to keep her company afloat, while her husband takes care of the kids, which does lead me to another great aspect that I loved about this movie. 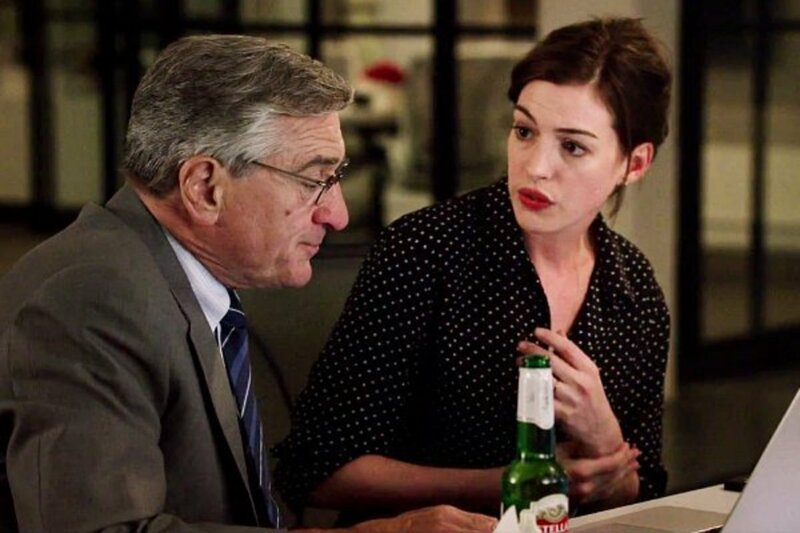 Unlike most of today's films where it often shows strong minded wives being portrayed in a bad light if they're too busy with work to be with their kids, "The Intern" takes a more liberal approach with the concept. Not only is Anne's character never vilified for being busy with work to the point that she sometimes doesn't see her daughter, but it actually plays it off like it's not even that big of a deal. Seriously, "The Intern" treats the concept like it's no different if the gender roles were reversed, while simultaneously never patting itself on the back for it. 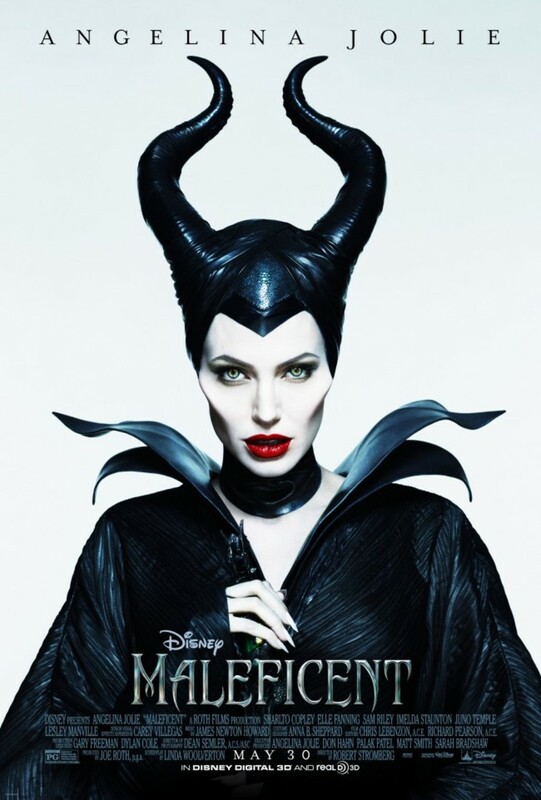 It's quite refreshing to see this on the big screen, and I honestly hope this trend continues in movies because having a strong minded woman supporting her family financially, while having stay at home dads, is nothing to be ashamed of. 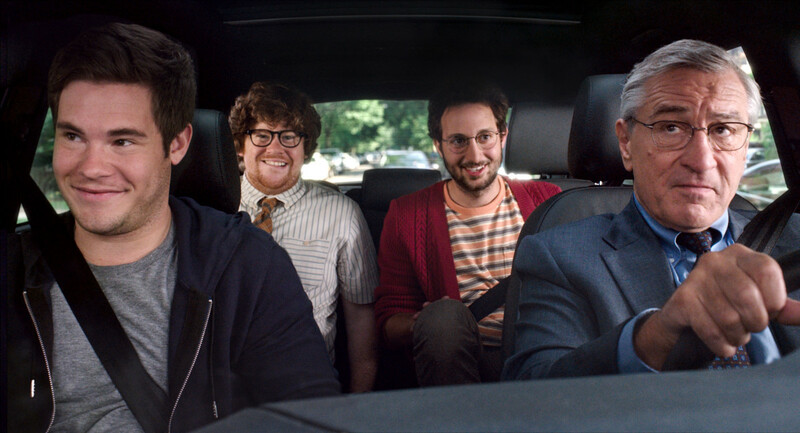 Overall though, "The Intern" was arguably the most charming comedic drama of the year thus far. Granted, I wouldn't say it's the best movie that Anne Hathaway or Robert De Niro have ever done individually. However, if you're just looking for a nice adult comedy that doesn't feature a heavy dose of d**k jokes, then "The Intern" is definitely worth checking out. The last line spoken by Jim Carey in this scene is pretty much the same message "The Intern" tries to tell you in two hours. Enjoy.